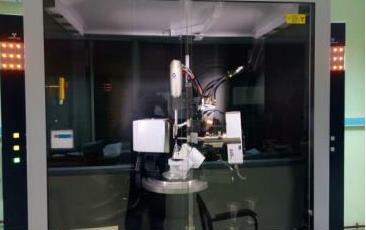 BRUKER D8 VENTURE SC-XRD system is used for 3D structure determination from single crystals. The system can be tailored to cover all typical single crystal applications in structural biology (other than for determining protein structures) and chemical crystallography. For greater flexibility the Bruker D8 VENTURE SC-XRD allows the combination of two X-ray sources (Mo, Cu) with a highly accurate goniometer. The PHOTON 100 CMOS detector is optimized for both Mo(Kα), Cu(Kα) radiations. The wavelength switching is fully automated. For the best use of the dual source, users are requested to give the expected formulae of the compounds (or at least the elements present) as accurately as possible in the registration form. The large area low noise PHOTON 100 detectorwith CMOS-sensor technology which facilitates shutter-less data collection. The machine is tested for its accuracy of data collection. For low temperature data collection, OXFORD Cryosystem attachment is available. The users who want low temperature data collection must give separate request during registration.